3 Domes at the top with 2 Drawers in front. Aarsun woods promotes a Indian handmade Wood temple design which is one of the best temple from our collection and is made up of Teak Wood (Sagwan or Sevan). This handmade Wood temple is suitable for homes as well as offices. The Temple is made from Teak Wood with traditional carving and good finishing.The Wood temple has beautiful floral and Leaf work along with elephant and peacock carving. The temple at the top roof area has beautiful gopuram style domes which gives it an authentic traditional look. Also, the natural dark walnut color on the wood temple also provides a unique style. Customization is available according to the need of the user. The unit is made carefully keeping in mind as per customer requirements.We provide a wide range of Wood temple design that can be customized as per your need. Contact us for a different Size. The Wood temple is made from Teak Wood and except plywood used at the back, ceiling and the base of the Temple. Teak wood (sagwan wood) is the deciduous tree which is used for making wooden furniture’s. Teak wood has its own natural oil which helps it to be termite and pestis free. It is one of the most long lasting woods even when it is not treated with oil or seal. We always use the old timber in making our products. Teak wood temple is mostly used in making outside furniture’s and boat decks. Over the time sagwan wood can change its colour into silvery grey finish when open into sunlight. Sagwan wood temple is very good looking and very shining golden-brown colour. In addition to this sagwan wood furniture is great to the touch, when compared with other wood such as Particle boards, MDF plywood. Sagwan wood temple is a hardwood and very strong, when compared to softwoods such as Mango wood or Pine wood, but also compared with most of the other hardwood species of trees. Sagwan wood furniture high durability for many long years (in many cases over 100 years). That is the reason why sagwan wood is best other woods and Durability can be counted as one of most significant advantage of sagwan wood. Sagwan wood content natural oil that resists termites (white ants), fungal stains, and also snub other insects that can destruct wood. This termites and protest resisting quality in turn increases the life span of wood, and that is the reason why teak wood is best compared to many other wood species. Teak wood furniture does not warp or reduce too much. It retains its dimensions and is a static material. Seasoning of wood involves drying the timber lumber obtained from trees, so as to reduce its shrink content and Well-dried wood is not easily moved by climate changes. 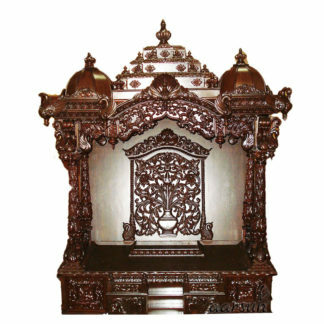 Good advantage of teak wood temple is that it has a good resistance to wet and water. Because this wood is free for fungus and sagwan wood temple is mostly used for making indoor furniture as well as high quality garden furniture. Use a cloth or any solid quality cloth to wipe it clean. To protect and avoid keeping the product near windows where it can be uncovered to direct sunlight. Note: This unit takes about 4 weeks to be manufacture and 1 week to be shipped.